VW is expanding its lineup with performance-themed ‘R-Line’ models. 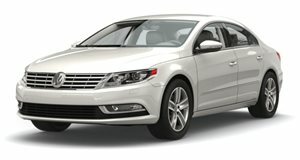 VW has finally gotten around to introducing the sporty-looking R-Line trim for the refreshed 2013 VW CC, which will be revealed on 1 June at the 2012 Leipzig Auto Show in Germany. Unlike the R range, R-Line models don&apos;t benefit from any serious performance upgrades but do get a few noteworthy cosmetic enhancements. The R-Line kit consists of a more-aggressive front bumper with bigger projector-style fog lights and intakes, and sporty body-colored side sills. It also rides on custom 18-inch alloys, there&apos;s a small R logo in the grille and the taillights are dark-tinted. Inside, the CC R-Line gets stainless steel pedals and doorsill plates that come embossed with R-Line branding. Obligatory luxury gadgets include paddle-shifters mounted to the multifunction steering wheel, bi-xenon headlights, rain-sensing wipers, LED daytime running lights, touch-screen interface, 12-way adjustable heated & powered front seats, automatic climate control, an eight-speaker stereo system as well as Bluetooth and iPod connectivity. The CC R-Line will arrive at US showrooms by the end of the year, powered by a 200hp 2-liter turbocharged TSI engine mated to a six-speed manual or six-speed DSG dual-clutch automatic transmission.